Germanwings flight 4U 9525, which went down in the French Alps killing all 150 people on board, was likely deliberately crashed by the co-pilot. He was alone in the cockpit when the accident occurred, according to a French prosecutor. French President Francois Hollande said that all the victims of Germanwings jet crash will be identified by the end of the week. However, earlier French experts said that the identification process would take months. 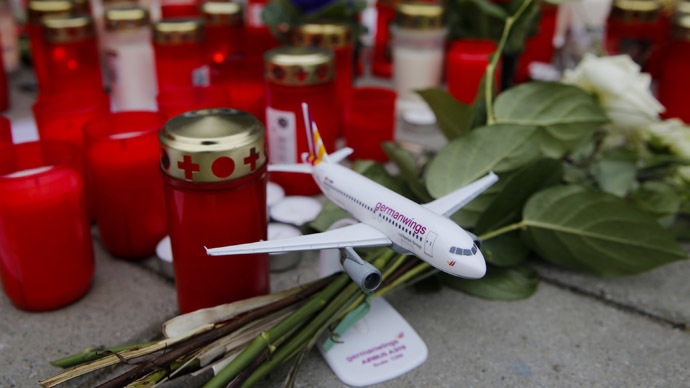 The German Federal Aviation Office (LBA) has requested the medical records of the Germanwings co-pilot to pass it to the French prosecutor’s office, Tass reported Friday. An LBA spokesperson said that pilots have to pass annual medical tests in their company’s medical center to obtain a new flight fitness license. Germanwings co-pilot Andreas Lubitz underwent treatment at the Dusseldorf University Hospital, a spokesperson for the hospital confirmed Friday. The treatment was unrelated to depression, Susanne Dopheide told RIA Novosti news agency. Earlier, German media reported that Lubitz may have received treatment for depression. France's leading pilots’ union has announced it is filing a lawsuit over leaks about the investigation into the Germanwings plane crash. Information about ongoing investigations must be kept secret, according to French law. The lawsuit doesn't name an alleged perpetrator, a method in French law that leaves investigators to determine who is at fault, Guillaume Schmid of France's SNPL union told AP. "We can understand there is a certain pressure, a wish to know," Schmid said, but added that leaking information too early can mislead the public. Italian carrier Alitalia has announced its flights will have two people in the cockpit at all times, a spokesman for the company told The Local.